When you train people for their role you increase their likelihood of success in mentoring! Mentoring relationships have a lot to offer in terms of personal and professional development for mentors as well as people who are mentored. Those that have a framework for the mentoring process and strategies for facilitating a mentoring conversation are more likely to be effective and enjoy their role. “Feedback from the workshop was extremely positive. I can only say it was very practical, focused and offered a vision that we can all work towards in mentoring. For me, the mentoring conversation with another attendee was very powerful: I was surprised how totally engaged we were. I have a deeper understanding of how vulnerable the mentees may feel as they share their concerns and experiences with a more established colleague in the workplace. My reading of this was that taking on mentoring carries a huge responsibility. With experience in fields as diverse as health, construction, energy, communications, law and government, Ann Rolfe will share proven and reliable models for mentoring success in an interactive workshop or presentation tailored to your objectives. 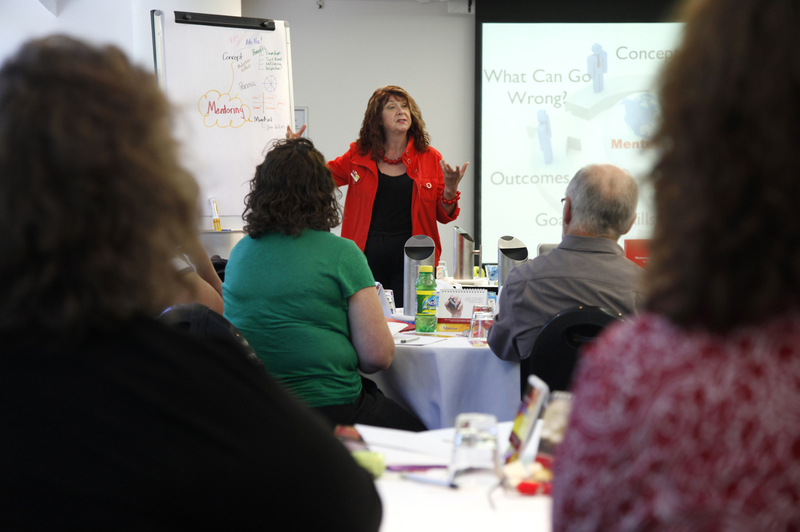 Phone 02 4342 2610 (in Australia) or email: ann@mentoring-works.com to discuss the kind of session or presentation you need.